Looking for romantic restaurants in Rome? With this romantic city as your backdrop, you are spoiled for choice! When I think about eating out in Rome for myself (with friends or with my husband), most of the time this conjures up a vision of bustling loud pizzerias, or, brightly-lit buzzing local spots. Love the fun vibe (and the food!) at this local Testaccio eatery, Da Oio a Casa Mia. But the close tables, bright lights and good-natured chattering does not make for a very romantic ambiance. These are often where the best food is, and it’s just the nature of Rome dining that places tend to be brightly lit, with bad acoustics. Of late, more restaurants in Rome do seem to be getting the lighting done right, but these are still in the minority. I’m used to this now so I barely notice it but that does not make for a very romantic meal if that’s what you are looking for. To me, romantic restaurants in Rome (or just about anyplace I suppose) should be quiet, low-lit, intimate, with discreet service, and of course, they should have wonderful food. And sometimes, especially in Rome, you can add in the bonus of a spectacular piazza or breathtaking view. Would you like a map of them all? Hop to the bottom of this page. Does it go without saying that pretty much any Michelin-starred restaurant will be romantic? Maybe . . . Below are places I’ve either tried personally, or know about through foodie and chef friends. Rome’s only 3*** Michelin restaurant La Pergola, is guaranteed to be one of the most romantic restaurants in Rome. It might be the setting in the uber-chic 5* Cavalieri Waldorf Astoria Hotel, opened in the 60’s but completely refurbished while keeping its style. It might be the sensational view over sparkly Rome below. But there is no doubt that super-star chef Heinz Beck is the main reason this will be one of the most incredible meals of your life. In the same hotel, there is another restaurant run by talented chef Fabio Boschero. L’Uliveto is a bit more accessible (in terms of price but also availability to book), and is also quite romantic. There are tables inside and out, at pool level. I’ve had the pleasure of eating here several times and every single dish is a work of art, both visually and culinarily (is that a word?) The food is heavenly! That’s the bottom line. Both La Pergola and L'Uliveto are offering special Valentine's Day dinners. In addition, the fabulous spa at the Cavalieri is also offering a special Valentine's Day package. There is also a special Valentine's cocktail with view, and a special Valentine's room package. You may see the details and rates here for 2019. The one, the only, magnificent luxury Hotel Hassler in Rome, at the top of the Spanish Steps also happens to have a Michelin-star restaurant. Combine chef Francesco Apreda's sublime food creations, with this view and you have one of the most romantic restaurants in Rome! Hassler Hotel, Piazza della Trinità dei Monti, 6. Tel. +39 06 699 34726. Reservations essential. Open daily for dinner from 7pm. Jacket required for gentlemen. One of the most romantic Valentine's Day dinners in Rome! Imago is offering a delectable and romantic Valentine's Day dinner. You may check here for the menu and price in 2019. Inside the Hotel Splendide Royal near the top of the Via Veneto. Gorgeous twinkly views of the Borghese Park and Vatican City. An elegant, old-style decor, but a wonderful experience to dine here, and first-rate service and food. I don’t work for Michelin, but in my very humble opinion, they deserve their star! My favorite thing about this restaurant in Trastevere is how gorgeous it is. They were one of the first Rome restaurants to really get design and lighting right. Chef Cristina Bowerman is one of Rome's best. Her food is creative but always Italian. Between the food, the lighting, the decor, and the location on a small Trastevere street, this is one of the most Romantic Restaurants in Rome. Creative, delicious food at this 1* Michelin restaurant near Piazza Navona. Set in a subdued, almost hushed ambiance, with lots of space between tables, soft, warm lighting and perfect service, this excellent restaurant is guaranteed to offer you a romantic evening out in Rome. One of the newer 1* restaurants on the Rome dining scene, this restaurant is definitely worth going a little out of your way for. (My Roman husband declared it was the best amatriciana he’d had in a very long time). Don’t go (only) for the amatriciana, as most of the food is innovative and a joy to discover. You could start with a visit to Rome’s modern art museum Maxxi, and head here after, making for a wonderful, romantic evening in Rome. I love the ambiance at this restaurant on the Aventine Hill, not far from the Circus Maximus. It's warm, yet modern, and gets all the comfort and design stuff right. The interior of the Corner restaurant is romantic all by itself, and in warm weather, you can also eat outside. It’s also lovely to sit outside in nice weather. And next to the restaurant, you get the bonus rooftop bar as well. There is no view, but it's still one of the most romantic restaurants in Rome. This 1* Michelin restaurant, located inside the elegant 5* hotel Palazzo Manfredi, offers one of the most stunning views in Rome - directly onto the beautifully lit Colosseum in all its glory. This is the view of the Colosseum from Aroma, the Michelin-star restaurant at the top of the Hotel Manfredi in Rome. So far I've only been for cocktails, but people I know who have eaten here say it’s fabulous. Near Piazza Barberini/via Veneto, Moma restaurant has long been one of my go-to restaurants when I want excellent food and a mellow ambiance. And in 2018, they received their first Michelin star! Well-deserved! But it's romantic to dine upstairs, in the inviting dining room with giant windows overlooking the street. (There is not much of a view, but the inside setting is warm and cozy). Excellent food from a young, inventive Roman chef, and fantastic service by friendly staff. There are several more Rome restaurants with 1 Michelin star, and one in Rome that has 2 stars. As these change over time, you may want to look them up on the via Michelin site. I didn't list them because I really don't know them (yet, but there's always hope!) But I am always updating my pages, so keep checking back. These Rome restaurants may not have a Michelin star, but if a breathtaking view is what you're after, you've got it! This gorgeous rooftop bar and restaurant is in the 4-star hotel Atlante Star. The only meal I had here was on our wedding night, which was a while ago (1999!) But it was wonderful and the view of St. Peter’s is stunning. They also have a wonderful, romantic rooftop bar (one of my favorites in Rome), with stunning views. Via Giovanni Vitelleschi, 34. Open daily. Phone - 06 687 3233. This rooftop restaurant in the luxury 5* Hotel Raphael offers some of the most beautiful views of Rome. I've only had drinks up here, not dinner, but those I know who have eaten here say the food is wonderful. The hotel is right in the centre of Rome, and when you dine on the roof, you get views all around you, from Piazza Navona to St. Peter’s basilica to surrounding rooftops and church domes. Not to mention the food is (supposed to be) amazing! This villa near the top of the Spanish Steps and on the edge of the Villa Borghese park affords gorgeous views of the city’s rooftops laid out before you. St. Peter’s dome is one of the best parts of the landscape. The food is quite good and the service professional. A friend of mine was proposed to here, and I doubt she is the only one this happens to! Want some help planning your romantic stay in Rome? Try these exclusive and special occasion tours. The ambiance of Marzapane is lovely and relaxing, which can make for a romantic dinner here. But the main reason to come is the food. Some of the best in Rome! I simply love love love this restaurant near Piazza Fiume (a more local area of town). The first time I ate at this wonderful restaurant located in one of Rome's latest urban-hip areas, Testaccio, I was surprised by how incredible the food was. The setting, in an off-the-beaten-track area, with their cool low-lit lounge and inventive bartenders, and the minimalist yet warm ambiance of the dining area makes Stazione di Posta one of my favorite romantic restaurants in Rome. Located on the prestigious via Veneto, inside the 5-star Hotel Majestic, the tastefully designed ambiance is the first thing you notice. Elegant, refined, you will know immediately you are in a special place. The most romantic thing about Casa Bleve is the entire restaurant itself (photo of the dining room at the top of this page). The wine selection at Casa Bleve is one of the things that makes it one of the most romantic restaurants in Rome. With its low-lit stained glass ceiling, hushed but warm and convivial atmosphere, this is hands down one of the most romantic restaurants in Rome. Not only that, but you can count on superb food, and an amazing wine cellar. Molto is just another local neighbourhood restaurant. Except when the neighbourhood in question is Parioli, that means a beautiful, elegant, restaurant where the upper-crust locals go dine in their hood when they want to see and be seen. The food is fantastic, and the ambiance and lighting are perfect. The first thing you notice when you walk into Clotilde is how lovely it is. The second thing is the chairs. You just want to sit there and enjoy it all. And they are as comfortable as they look. Clotilde is my latest addition to this page about Romantic Restaurants in Rome. Everything from the lighting to the comfortable chairs to the exquisite food will make for a romantic evening. But this page is about Romantic Restaurants in Rome and so yes, I must say that Clotilde is right up there. The ambiance is lovely, warm, cozy, and romantic. But the best part is the food. Clemente Quaglia is from Ciociaria, a part of Lazio just south of Rome. He creates innovative dishes that are inspired from his Ciociara roots, which means, using very simple ingredients. And the result is a kind of local, yet improvised regional cuisine. And it's all delicious! Piazza Cardelli, 5. Tel: 06 6880 5145. Open Tuesday - Sunday for lunch and dinner. Closed Mondays. If you want something different, like some of Rome’s best fusion sushi, Me Geisha at Mò Mò Republic is the place for you. Chef Rodeglio Aglibot has turned this spot into one of our favorite sushi places to eat in Rome. And it’s not only sushi, there are other signature dishes by the chef as well. Me Geisha offers a romantic setting, and the unique sushi fusion dishes here are out of this world! This is the place for a romantic, sushi dinner in Rome. And, Me Geisha is inside of a larger structure, Mò Mò Republic, that includes a gorgeous cocktail lounge, a pool, lots of green space and an overall fun and romantic atmosphere. Cuisine, service, ambiance and location are all winners here. Deep, comfy cherry-red seats, and low lighting, and a wonderful wine list, plus their location right near the Pantheon, all make for an excellent choice for a romantic aperitivo. This enoteca has beautiful ambiance, and a killer wine list. And, yeah! Their food is wonderful too! 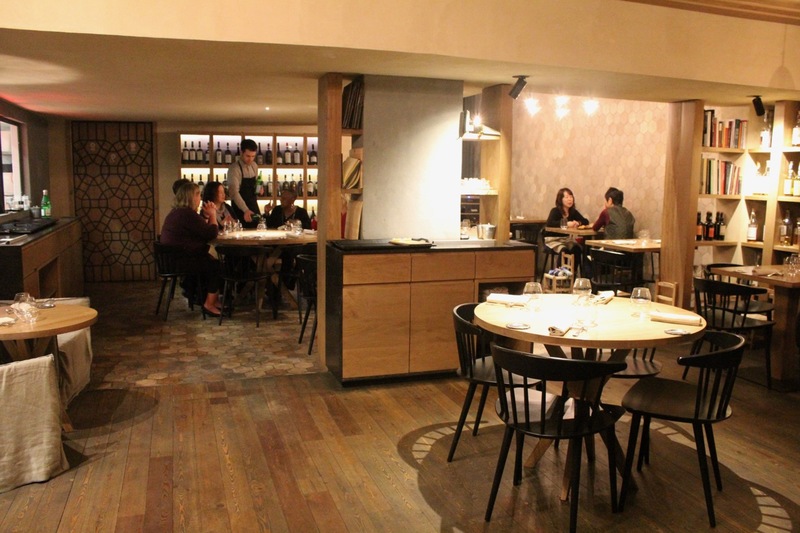 An excellent choice in Prati for a romantic enoteca. If you’ve read other parts of Romewise, then you know how much I love this wine bar near the Pantheon, right on Piazza di Pietra. If you snag one of the tables at the front, you can even spend your time gazing at Hadrian’s temple. Enoteca i Colori del Vino is one of the loveliest wine bars in Rome, with a superb wine selection, soothing atmosphere, and even delicious food! Along with Spiriti, i Colour del Vino is my other favorite wine-bar in Rome. Wine, ambiance, food...head here for a romantic pre-dinner drink, or even to enjoy dinner here! Trattoria Monti is already one of my top-five restaurants in Rome. Which means come for the food. One of my favorite overall trattorias in Rome, Trattoria Monti is also a romantic place to eat. But they get everything else right too - lighting, decor, ambiance, service. As far as "local" trattorias go, this is one of the more romantic restaurants in Rome. Flavio al Velavevodetto in Testaccio is one of the city’s quintessential Roman trattorias. But it's a little hectic (which is normal), and crowded. Flavio has another restaurant in Prati, Flavio ai Quiriti. Go to this Flavio if you are looking for a more romantic trattoria. Just near the Pantheon, this restaurant gets everything right: innovative, fresh, very Italian cuisine; excellent low warm lighting, soft music, and friendly service. They also have a pastry chef so save room for dessert. I strongly recommend the tarte tartin with homemade cinnamon gelato and mascarpone cream. Inside is warm and inviting but tables are close together. The food is good, but not amazing. The best part about eating here is the cozy feel and the setting, and proximity to the Pantheon, Piazza Navona and Trevi Fountain, which makes for some beautiful and romantic post-dinner strolling. With this map of all the romantic restaurants in Rome listed on this page, you can select by any category to see where they are. Each map point also shows the address, website and phone no.